It was quiet, very, very quiet. The atmosphere was quiet too, sounds being blanketed by the fog which hung in the air, obscuring all but the nearest items in a veil of mist that somehow made the place look different. Nothing at all stirred amongst the reed-beds of the Fen trail. Following my instinct I walked towards the old pump house. Across the meadows I could see a Heron (Harnser) guarding his woodland edge patch jealously and also searching for food in the dyke (Norfolk for "ditch", in case you are foreign; e.g. from Yorkshire or Essex, etc,. ;-). Something flew behind the pump house as I approached slowly, but I could see no trace of it. Heading towards the woods was another story. First I watched a Harnser take off and fly across the front of the woods on the Buckenham side. Then the pleasant sight of a graceful barn Owl flying the opposite way, from the Strumpshaw woods to the other side. (see below) It was shrouded in the fog, but still worthy of an image grabbed quickly as it glided past in the distance. Heading around the 'Z' band I disturbed another Barn Owl that was on the floor in the woods, quite near to the corner. When I say "I disturbed.." I was actually trying to move slowly and quietly but the "crunchy gravel" laid along that path frustrates even the best efforts at stalking closer to wildlife! Why can't we have some nice quiet top-soil on it too? Just after that I met a couple who were "lost", apparently having missed the turn-off to Reception and the car park. Just as well I was there as they wished to get away quickly and may well have ended up back at Tower Hide had I not been! Knowing that all in the woods would be disturbed, there was no point in looking too hard; plus being foggy it was quite dark too under the trees. By 5.30 I was back at the Reception Hide and all on my own, save for the site manager in his workshop. I sat by the opening and watched. Not long passed before the Kingfisher came and bagged a late supper. I was hoping that maybe, now it was quiet, a Bittern may creep by. 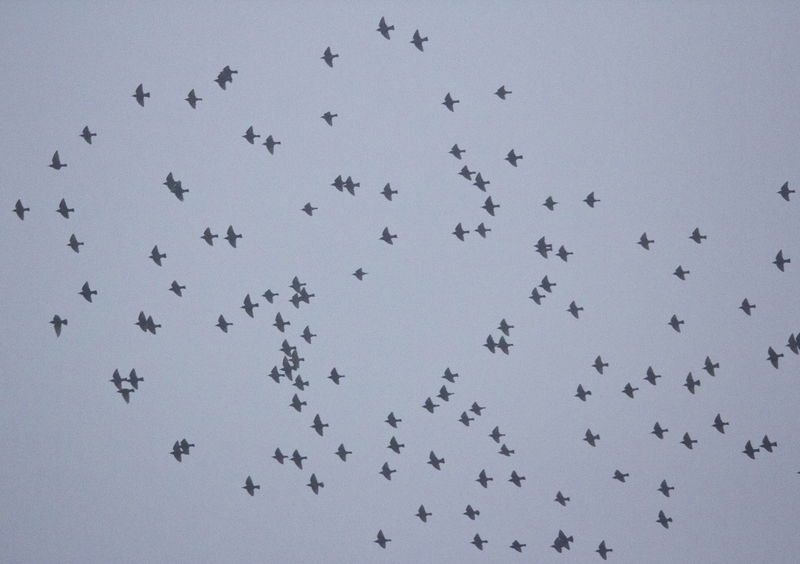 Then I saw the first batch of starlings arriving. For over 20 minutes they circled and swooped over the reeds before settling down. This little flock, of around 100 birds, appears to be the first ones back at Strumpshaw. 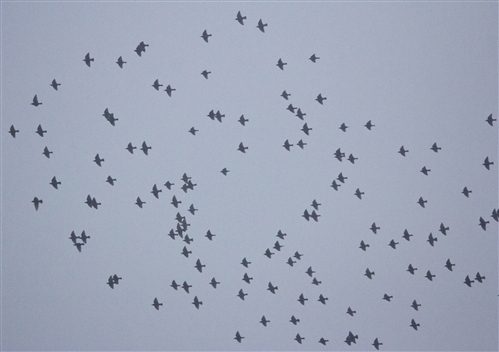 I had earlier seen a larger flock flying N.E. towards Buckenham or beyond. Seeing them disappear into the fog and then reappear was quite fascinating, but as it was getting quite dark, too dark for any more photo's or to see anything clearly, I headed home. The moral of this story is that even on a foggy day, when virtually all others appear to abandon the site, there is till something wonderful to see. So instead of huddling indoors around the fires or watching mind-numbing day-time TV programs, get out and enjoy the peace and tranquility of Strumpshaw in the Fog. I agree with you completely - and thank you for the beautiful Barn Owl. We had a Sparrowhawk at the end of our garden yesterday - I suspect the foggy conditions worked in its favour as I imagine the small birds could hardly see it!